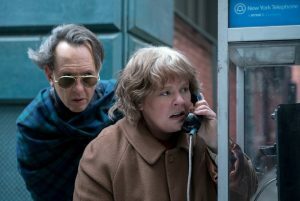 Right off the top let me just say that Melissa McCarthy is going to pick up her second Oscar nomination, this one for Best Actress and Richard E. Grant is going to get his first for Best Supporting Actor. 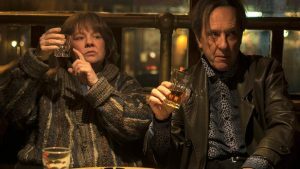 They both deliver superb performances in one of my favorite films of the year. Can You Ever Forgive Me? 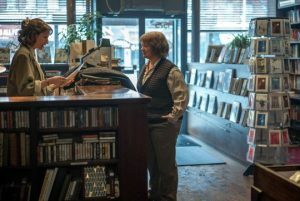 is based on the Lee israel memoir of the same name and is wonderfully adapted by Nicole Holofcener and Jeff Whitty. Holfcener is best known as the writer- director of such films as Enough Said and Friends With Money. I wasn’t sure what to expect though I knew it was based on a true story, I didn’t know the details or what the outcome was. didn’t know the details or what the outcome was. It’s a great story and I was pleasantly surprised by how much I enjoyed it. 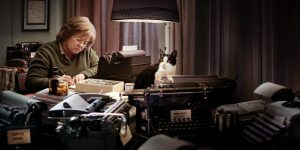 Israel (Melissa McCarthy) was an established writer who wrote books about successful women. Her career hits a dead end around the early 90s partly due to writer’s block but mostly because of her alcoholism and her nasty disposition. She is not a likable lady. In order to generate some cash she decides to sell a framed letter she received from Katherine Hepburn. She happens upon a couple of more original letters from comedian Fanny Brice and sells those. She realizes there is good money in selling letters from famous people and starts to create such letters and making a good living off of them. She makes friends with Jack (Richard E. Grant) a gay local ne’er do well, who becomes her accomplice. It’s all fun until it’s not and things fall apart. Can You Ever Forgive Me? is well directed by Marielle Heller and creates a feeling that reminded me of of the 1970s films. It’s a character study about two very imperfect people at the end of their rope who come up with a scheme for success that is doomed to fail. Those 70s films had a certain feeling, think Scarecrow (1973), The Conversation (1974), King Of Marvin Gardens (1974, Going In Style (1979). That being said, this film does have a lot more humor going for it than some of those 70s films and the ending is as tragic.The good photography captures New York in the early 90s, the soundtrack is filled with old 1930s and 1940s standards which makes you feel like you’re in a wonderfully warm dive bar. It’s wonderfully balanced and entertaining. I noticed a song on the soundtrack by a group that I saw at Jazz Fest this past May. Tank and The Bangas! They were great! Cool to see them on the soundtrack! !